Bernice and I have already been out for our morning walk--her usual walker, Jenni, is visiting her Grandmother--and made sure there were no unwelcome critters hiding out in the culverts. This is Bernice's main job in life, and she takes it serously. :) If she doesn't protect us from the wild turkeys, incessantly plotting their dastardly uprising, who will??? We paid a too brief visit to my mom yesterday--don't see her often enough. It was rainy out, but today you'd think we were on a different planet--bright blue sky, sunshine, the works. It's almost springy, even with the chill, but there is a polished-copper glow to things that says autumn. Glorious. My spirits are high and I'm ready to finish reading my manuscript (the changes need to be in tomorrow) and get back to "Big Sky Mountain". :) I will admit, though, that watching Debbie and Nicole and now Chris do all that work makes me tired. That's the news from Spokaloo. Today I'm reading through the edited version of "Big Sky Country", so I'm taking today off from the blog. It's another lovely day, both here in Spokane and in Parable. Guess we're getting rain tomorrow, but, hey, that's tomorrow. I'm concentrating on Right Now, which is pretty darn good. I'm loving this wonderful weather--what's not to love about sunshine, fresh air, blue skies, and greenery on all sides? I finished "The Kitchen Counter Cooking School" (Kathleen Flinn) and enjoyed it very much. Now I'm onto "The End of Normal", a memoir by Mark Madoff's widow. Of course you already know that the infamous Bernie Madoff, Mark's father, ripped off billions and almost crashed the stock market--pretty scary to think one person could do that, practically single-handed. I can't help sympathizing with the plight of this young mother and her children, though, because they too were victims. Still, I think I'll listen to something a little happier on the next go round--one I'm particularly looking forward to is Kevin Sorbo's new book. I've met Kevin, since he played Chance in my one and only TV Movie, "Last Chance Cafe", and he's not only seriously cute, he's nice. I was hoping to catch Debbie Macomber on QVC yesterday, but somehow I missed her. Drat! I have work to do, so I'd better get at it. This lovely, lovely weather is so heartening for me. I just love it. (I'm working on learning to love snow, too, as the TV people say this is a la Nina year.) :) Today, though, I'm in the moment--recent losses have reminded me how precious NOW really is. I'll be making a trip up to Toronto soon, to meet with my fabulous publishers, the Harlequin people. Lots of exciting stuff going on, career wise, and I always enjoy the visits. The D.I.E.T. is becoming a L.I.F.E.S.T.Y.L.E instead. :) Honestly, it's so easy, and the food is very good. I get variety without having to page through cookbooks, buy ingredients, and throw something together. (I will be making my Beef Bourg. for Christmas dinner, though.) I have a ways to go yet, in terms of pounds, but I'm confident enough to wear jeans again, and that's a nice feeling. I'm a foodie at heart--never miss "The Splendid Table" via podcast and I'm listening to a book called "The Kitchen Counter Cooking School", and enjoying the process vicariously. (Much lower calorie intake that way.) Besides writing and my pets, my passion these days is art, of the mixed media type. Today is a writing day--I'll be spending most of it in Parable, Montana, with Hutch and Kendra, the new story people. And that's the news from my kitchen table for today. Today is a spectacularly beautiful fall day--every pine needle for miles shimmers with golden light, and the sky is sugar-bowl blue. There are a few leafy trees on the property and they are ablaze with the fire of autumn colors like crimson and gold. No WONDER fall is my favorite season. I listened to John Lithgow's autobiography, "Drama", and enjoyed it a lot. I have some new podcasts to listen to, as well. And that's the news here on the Triple L.
Mary Ann's little dog, Fergie, died unexpectedly yesterday afternoon, and we are all feeling pretty sad. She was a sweet little buff-colored mutt, and adored Mary Ann, who adored her right back. They were always together, sidekicks. Every morning when my cousin arrived for work, Fergie was with her, happy to greet all of us. It was as if she were saying, "Fergie's here! We can start the fun now!" When she wagged, it wasn't just her tail, it was the whole critter--I called her the Pajama Bag dog. She was a member of the family, just as Sadie was, and will be sorely missed. That's the sad news from my kitchen table---but already the happy memories of her long and love-filled life are there to be cherished. Is starting out with overcast skies, and that delicious autumn snap is in the air. Downstairs, my craft room/studio is undergoing an amazing transformation, due to the Dynamic Duo, Debbie and Nicole. :) Incredible! Tomorrow marks another seven days on the D.I.E.T., which I'm beginning to think isn't a diet at all, because it's way too easy and I never feel deprived. As Barbra Streisand wailed in "Funny Girl", when her character, Fanny Brice, got her big break in show biz right off the mark, "Where's all the suffering???!!!" I'm writing today, and composing a list of favorite romantic books/authors for a promotion I'm taking part in. Most of my faves are classics, since I don't have time to read anywhere near as much romance as I'd like to these days. Be well, be safe and be kind. Debbie arrived yesterday morning, and already she's going through my craft room like a whirling dervish. :) Her daughter, Nicole, arrives tonight, and then there will be two hurricanes downstairs. Me? I'm working on the new book. The first chapter is always the most challenging, but I have the opening scene down and that counts for a lot. Beautiful autumn weather today. I'm loving it. A question I've gotten about "The Lawman's Christmas" is, How does Sawyer McKettrick fit into the clan? Well, he's Kade and Mandy's son, and the hero of next year's book, "The Gunslinger's Christmas." That's the news for today. Stay well. Debbie K--also known as Hurricane Deb--has struck land. She's been my friend for many, many years, and as I said on Friday, she's come to dig out my craft room/studio so I can avoid being featured on "Hoarders". I'm off to Parable again today, to reunite with Hutch and Kendra, the hero and heroine of "Big Sky Mountain". My long time friend and the most organized person I have ever known will be arriving soon, along with her equally industrious daughter, Nicole, to--wait for it--put my craft room/art studio in something remotely resembling order! YES. It's going to happen. Not only will I be able to work on my many projects with a peaceful mind, but all possibility of my appearing on "Hoarders: Buried Alive" will be eliminated. Last night was 'My Night' on the D.I.E.T., so I had my one glass of wine and a Live-Smart dinner from Schwan's--enchilada and rice. So much for my cooking hobby. It seems I can either be slender and watch what I eat, or go all out in the kitchen and look like an Italian opera singer, girthwise. I choose the former. Rain on the way--I'm sure we need it. And the horses will be back in their stalls at night, starting this weekend, snug inside their sturdy barn. I feel a little like that turtle in the famous race with the rabbit--just plodding along steadily, while the rabbit runs circles around me. :) 7 weeks on BistroMD and I am down a shade under 20 pounds (insert a resounding yeehaw here) which is good when you consider that I haven't felt deprived even once. And I'm up to 15 minutes at a time on my treadclimber, too. Bernice is waiting somewhat impatiently for her walk--trust me, she doesn't plod. She's one busy little Yorkie, and she'd fly if she could. When she was a pup, she could run so fast that her legs were quite literally a blur. She liked to catch Sadie by the tail and hold on, and their running games were a hoot. They'd go streaking by with Sadie in the lead and Bernice in hot pursuit, then they'd shoot by again like a pair of furry bullets, this time with their positions reversed. How I treasure those happy memories. And how precious, my friends, is the Right Now. Beautiful autumn sunshine today--favorite kind of day in my favorite season. Color me in shades of Grateful. OK, I have published over 100 books--I only know this because Romance Writers of America sent me their Centennial Award, a beautiful plaque--so publishing shouldn't be anything really new to me, should it? YES. Because this time it's my art--my artist trading cards will be featured in the (regretably) last issue of ATC Quarterly! I'm excited, obviously, partly because my work was chosen for this honor before the editors knew I write books, so one thing had nothing to do with the other. I'll keep you updated. I drafted the outline for "Big Sky Mountain" yesterday, after days of brainstorming, and I'm polishing and revising today. I will start Chapter 1 as well, and I can hardly wait for that. The D.I.E.T. continues to be ridiculously easy--I love the food and the convenience and the not having to think, think, think about food all the time. How many points? How many ounces make a serving? How many calories, carbohydrates and/or fat grams? Yikes. What a relief to simply take the next day's three prescribed meals out of the freezer every evening and transfer them to the fridge in the kitchen. Read, heat, eat. It's just right for a woman who would rather be thinking about characters and their stories than food. The house is pretty quiet this morning. Bernice is off with Jen, Mary Ann went to buy horse feed, and Larry is out at the barn, wrangling. It's just the kitties and me and that's kind of perfect for starting a new book. And that's the news from my kitchen table, folks. See you tomorrow. I'm doing the outline for "Big Sky Mountain", Hutch and Kendra's story, today. And I'm starting the book itself tomorrow. I have the opening in mind and I'm ready to roll. I do miss Sadie-beagle, every single day, but any tears are about gratitude for every moment we shared, my goofy little dog and I. What lively joy and constant laughter she brought into my life, at a time when I didn't even realize I was lonely. Bernice, the Yorkie, is thriving--I'm sure she misses Sadie, too, but she had a chance to get used to her absence because Sadie went to her trainer three times a week, and toward the end, she was away from home a lot, being treated at the clinic. Speak of the dickens. The mighty Turkey and Moose Hunter, Bernicie, is back from her walk with Jen, and eager to tell me all about her adventures. And that's the news from the Triple L.
I did not paint the birds in either of these encaustic collages. They're transfers. On another subject, today is Thanksgiving in Canada. I think that is so smart--holding this particular holiday earlier. Ours is much too close to Christmas--one has barely assimilated one turkey dinner with all the trimmings, when it is suddenly time to have another. The time between Thanksgiving and Christmas is hectic, even frenzied, for so many. Columbus Day, on the other hand. I don't really see the point in that at all, but that's just one woman's humble opinion. I'm working today--and I can't wait to get started. Bernice the Yorkie and I went for our usual morning and afternoon walks over the weekend, and encountered nary a moose. Thank heaven. You can bet I keep a more watchful eye on our surroundings, though. Our friend, since dubbed Harold, paid little attention to us, but had he been in the fiesty mood he evidenced later, Bernicie and I might have been pulp. That's the news from my kitchen table, folks. Be well, be kind, be safe. And Here It Is Again--Friday! The salmon, spinach and single glass of wine I had for dinner last night were delicious. Okay--the wine, not so much--that tasted a little on the vinegary side. Maybe I'm losing my taste for the stuff--but I'll always love coffee. :) And tea. 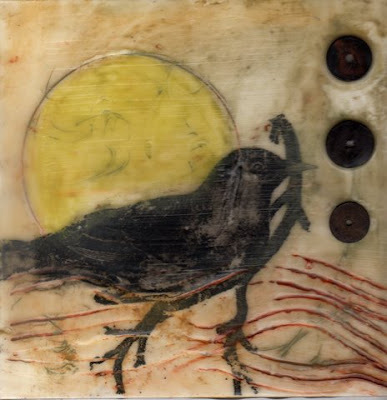 I'm attending an art class tomorrow, and I'm very excited because the process (encaustics, painting with wax) is all new to me, and you know how I am about processes. I will surely arrive home at the end of the day tired, covered in wax splotches, and grinning from ear to ear. Have a good weekend, and I'll be back on Monday. We have more rain today, but the house is warm and brightly lit and the critters are all around, so I feel blessed. I'll be doing more brainstorming today and kicking up my heels a little because "The Lawman's Christmas" is #19 on the NYT bestseller list--great spot for a Christmas hardcover. Thanks to all of you who helped make that happen. Other news: my good friend Debbie Macomber will be on QVC on October 26! I don't know the time yet, but when I do, I'll post it here. Is that exciting, or what??? That's the news for today, pardners. Time to saddle up and ride. I'm still brainstorming, and I watched the second DVD (the two parter I mentioned yesterday) last night. I'm reading "The Night Circus" on my Nook--truly an original story, well told. I'm still making gel transfers on metal and getting results I really love. I use copper, mostly, for the background, because I love the rich glow. Looking forward to Saturday, when I'll be taking an art class in encaustic painting. Me, using hot materials? Don't worry; I will be well-supervised! D.I.E.T. update: I'm losing between 1 and 2 pounds per week--not very fast--but the truth is, this food program (BistroMD) is so ridiculously easy, and the food is so good, that I think I could do it for the rest of my life--provided I could have a glass of wine with dinner. I do miss that. 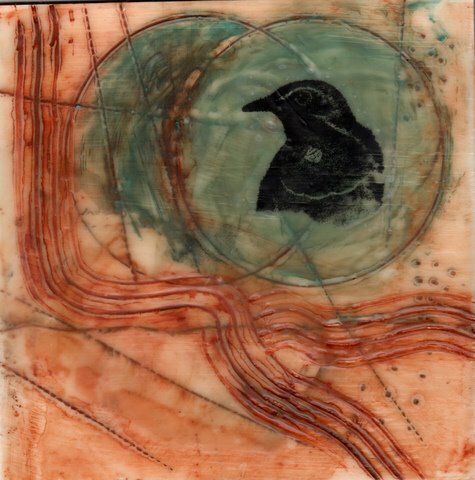 I continue my experiments with gel transfers on metal--mostly copper, which is my absolute favorite. I have a radio interview this afternoon, and more brainstorming to do, so I'd better run. Linda and Bernice's Great Adventure! It was a quiet weekend, all told. The most ambitious things I did were to make a run to the grocery store for diet soda and pet stuff and drop in at the big Art Extravaganza at Spokane Art Supply. Yesterday, Bernice and I were out for an afternoon walk--she insists--and pretty much minding our own business. She was patrolling all the culverts and I was thinking about--you guessed it--the new book, "Big Sky Mountain". Out of the corner of my eye, I see a flash of bay on the driveway, maybe a couple of dozen feet out, and think to myself, "Oh, ---, one of the horses is out!" We see moose on the Triple L from time to time, and we're always fascinated, but this was different. He stayed. Just laid himself down in the front yard, head up, and rested. For, like, an hour and a half! That's when I took the video--through my office window. I texted Jen, who lives above the barn, and alerted her to the presence of wild life, and the adventure continued. She took oodles of pictures--some quite close up--until her phone battery died. Finally, after much vegging (maybe he just finished a book, too), Mr. Moose got to his feet. Now, he was feeling fiesty. He tore my outdoor lamp-post thingy to pieces, at one point sporting some of the bullbs and wires in his antlers, and proceeded to tear up a few shrubs in the bargain. How thankful am I that he wasn't in this mood when Bernice and I were out there in the open, and a worrisome distance from the house? REALLY thankful. For all I know, he's still around here somewhere. That's the news from the Wild West.